Haven’t you canceled your Times subscription yet? Seth at Seattlest has had enough of the Seattle Times . Why? Because Times columnists (such as the ever-irritating Joni Balter) seem to think that a tougher Teen Dance Ordinance would have prevented Kyle Huff from killing seven people at a house party last weekend. Apparently if there are no all-ages dances, or if there is a curfew, no kids would ever be in a position to be victims of a senseless crime committed by a maniac. Of course, these particular kids (and they weren’t all kids, but at least a couple were underage) were in someone’s house. If there had been a curfew, they could have partied indoors all night, not violating any curfew rules — and Kyle Huff might still have snapped, for whatever reason, and the result would have been the same. Thinking that a curfew or a teen dance ordinance will prevent anything bad from ever happening to your precious children is short-sighted. I can promise you that when the old TDO was in effect, my underage friends managed to get in plenty of trouble, some of it serious. And when I had a curfew, I didn’t always manage to get home on time, either. But the one time when something seriously bad could have happened to me (I was the object of an attempted abduction — luckily foiled by a neighbor who came along at just the right time to frighten the abductor into letting me go), I was walking home from the corner store, in a perfectly safe and normal Seattle neighborhood. In broad daylight (I think it was a Saturday). It was spring. It was 28 years ago this spring. If things had gone differently, would it have been the fault of my parents for letting me walk to the store in daylight? Or of the city for not having a 2pm curfew? No. It would have been senseless, and it would have been no one’s fault… except the guy who grabbed me and tried to carry me away, only half a block away from my own home. I guess I’m ranting a bit here. Anyway, Seattle Times , Joni Balter, you should be ashamed. Assign misguided blame all you want, but I don’t know how you sleep at night, all smug in bed. 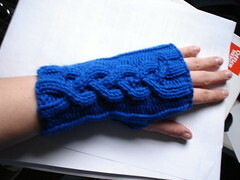 Imagine my surprise to find that someone has made not one, not two, but all three of my wristwarmer patterns! They look lovely, too. The knitter is AK_neve, and the Little Twist wristwarmers here are knitted in Debbie Bliss Cathay, which is silk (though I forget what percentage is silk). 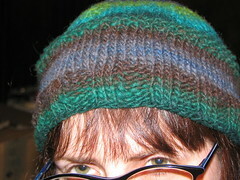 With that yarn, the stitch definition is really nice! 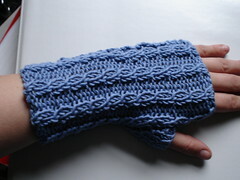 I am just thrilled to see that people are knitting cool things from these patterns. Thanks, AK_neve! 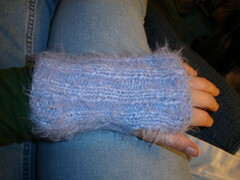 Tanya knitted these Little Twist Wristwarmers (Craftster post/blog post) from my pattern; don’t they look nice? I like the pale gray color. Pre-pixelated clothes for reality TV shows: one of those ideas that seems so obvious once you see it. I love it! I want to buy a few of these. What kind of a world do we live in that people have to be “pixelators” for a living? Who are the freaks that would sue if their logo was on someone’s t-shirt in The Real World ? And what is the point of blurring something that’s already blurred? Gah. “You’ll Never Be a Man” — Elvis Costello. Who is of Irish descent. The Slacktivist blog this week had an interesting post comparing the way progressives perceive those who support torture with the way evangelicals perceive those who are pro-choice. There are some good follow-up comments as well, though of course the discussion got bogged-down as discussions on this topic always do. “I Can’t Go For That” — ProGrammar; this is the Hall & Oates song, covered by a guy doing all a capella and human beat box stuff. It’s kind of fun. “The Fourth Dimension” — the Ventures; this is a cover of the Frantics’ song “Werewolf” (well, I think the Frantics themselves might have been covering it as well — I’m not sure), without the horror-movie narration and with more “spacey” sounds. “Say You’re Wrong” — Julian Lennon; I admit to an inexplicable soft spot for Jules. “Common People” — William Shatner; one of my favorite singles of the last few years. “Weather With You” — Crowded House; one of my least favorite CH songs — the chorus to me sounds more like an old beer commercial jingle than a great song. But it has its moments. When I started knitting, almost a year ago, I started reading a lot of knitting blogs and forums. Because I’m obsessive that way. And I kept seeing all of these references to something called “Clapotis”. Clapotis this, Clapotis that — it sounded like some kind of disease. And not a very nice one, either. 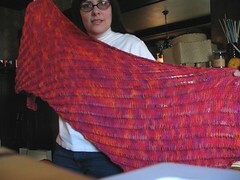 But as I eventually realized, it’s actually a knitting pattern, for a scarf/shawl hybrid. “Ho hum,” I thought, and went on with life. But then, I started spending a lot of time browsing Flickr. 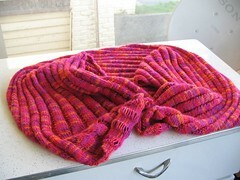 And I saw Clapotis after Clapotis, and they were all so darned gorgeous that I started to want to knit one. One day I had an extra ball of yarn sitting around, and I thought “hmm, let’s just play around with it a bit to see what a Clapotis would look like with this yarn.” I started knitting, and then I was hooked. This was a mini-Clapotis, a little scarf that I finished quickly, but it just made me want to knit the full-size Clapotis more. I tried it in one yarn, and I didn’t like the way that was going, so eventually I resorted to the yarn the pattern calls for: Lorna’s Laces Lion & Lamb in the gorgeous (and… very pink) Bittersweet colorway. 19 days later… a Clapotis! You can see in the picture here that it’s a pretty big scarf. It’s almost as long as I am tall, and it is very wide. 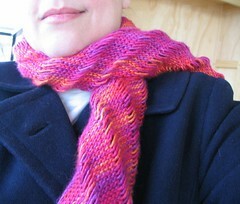 It makes a nice warm shawl, but also a nice scarf, all wavy-like. So now the Clapotis is done and I am free, free from the Clapotis Compulsion (only a year after the rest of the net knitters, but hey, I only started knitting less than a year ago). No more wraps and scarves since summer is coming! But then I see this… and this… uh, I might be doomed again.